On My Bookshelf, No. 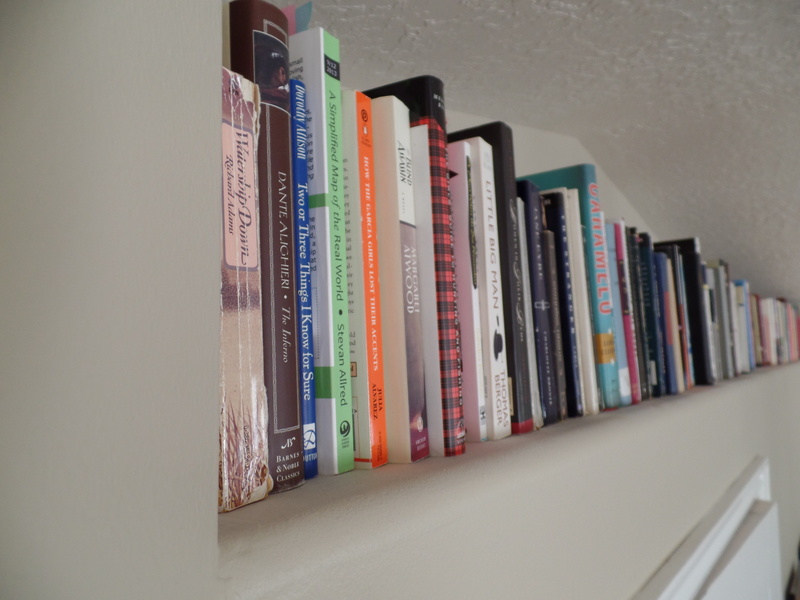 14 – The Bookshelf of Emily J. To see previous posts in this series, click here. Here is a snippet of what’s on it, ten at a time. If you haven’t yet read any Edith Wharton, now is the time to start. She’s a fine novelist. I’ve also pushed Dorothy Whipple’s work here on my blog before, as I wrote my Master’s thesis about her book The Priory. The only Edith Wharton I’ve read (and indeed the only book in this list) is Ethan Frome. I believe it’s quite different from her usual books. On this shelf I’ve only read two of the Edith Whartons (Ethan Frome and Summer) and Someone at a Distance. I may have read Breathing Lessons a long time ago, but I don’t remember it. Yeah, I don’t really remember Breathing Lessons much either. My favorite Anne Tyler is The Amateur Marriage. I’ve read it a couple of times. I haven’t read that one. I’ll check it out. I like your name, AND your nickname! Waaay back in the day, I taught a course which included the novel “Summer.” The course was based on the Pygmalion myth. We read the myth out of Ovid, then we read George Eliot’s “Silas Marner,” next, William James’s “Watch and Ward” and last, Wharton’s “Summer.” We ended the course with George Bernard Shaw’s “Pygmalion.” I remember I had wanted the class to watch “My Fair Lady,” but we ran out of time! Gaaaaa. While we didn’t plan it, the older male caretaker/husband of each novel became progressively nastier with the culmination of the despicable Lawyer Royall in “Summer.” It was a fun class, and as you can imagine, a great deal of discussion. How interesting! I would have loved to take that class. I heard about Summer because we read The House of Mirth in an American Lit course, and one of the students wrote her final paper about Summer. I remember the professor wasn’t all that impressed with the obscure novel, but I was glad that the other student brought it to my attention. Thank goodness for your fellow student and Good for you! You know I always resented those profs who scorned this or that novel. I remember as a young English major, I read- on my own- Steinbeck’s “Travels with Charley” and loved it. I told my Am Lit prof about it and he made a face. “It’s an embarrassment,” he said and turned away. It was a defining moment. Yeah, I’m pretty relaxed about the supposed “canon.” I wrote my master’s thesis about a woman whose books were referred to as the bottom line for a feminist press in the 70s. They called it the Whipple line, which couldn’t be crossed, but I like it when those obscure authors and novels are given some attention. I’ll have to explore Summer. I do like the Edith Wharton’s I’ve read and I do love Anne Tyler (I’ve read a few although I agree with you about the Amateur Marriage). I enjoyed All the Kings’ Men too that I read in a course on Faulkner and other Southern writers. I read All the King’s Men for a lit course too. I’m glad I did. I always loved it when those courses introduced me to authors and novels that I would have never picked up on my own. Glad to hear you recommend The Amateur Marriage as a good Tyler read. I own it. And, darn it, I really need to read Divine Secrets of the Ya-Ya Sisterhood. Own it, too. Loved the movie and I bet the book is even better! Really need to read a Wharton! Yes, you need some Wharton in your life! And I would definitely recommend that you read The Amateur Marriage. Such a great novel. I think it is one of her best. I love reading your blog. Keep up the good work. Anne Tyler is another author on my TBR list. I saw her latest novel, A Spool of Blue Thread, in the book store recently and it looks great. 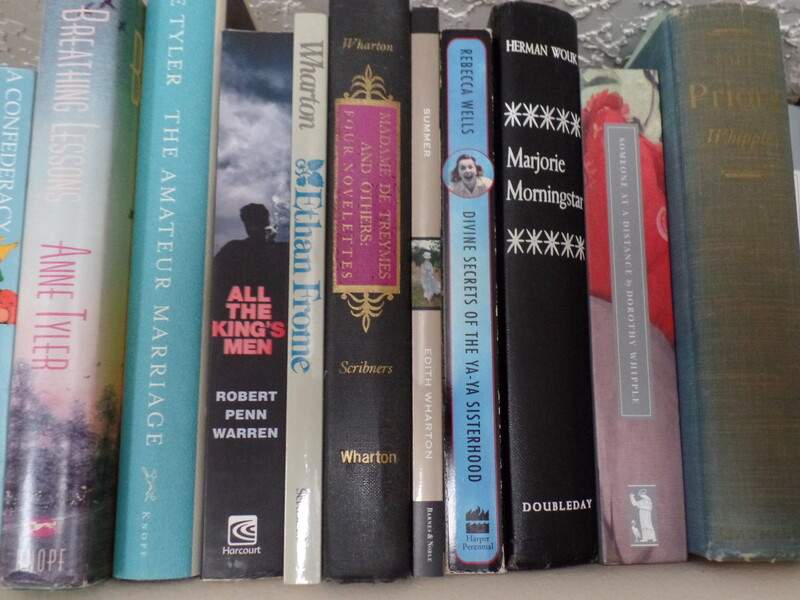 I also noticed a copy of The Amateur Marriage in the library, which I think I’ll borrow next time I’m there. Would you recommend her writing? Any novel in particular? I recommend The Amateur Marriage. That one is my favorite, but all of her books are well written and enjoyable. My aunt introduced me to the fabulous Dorothy Whipple through the beautiful Persephone Books in London. I loved ‘Someone at a Distance.’ I also adore Anne Tyler although I have only read about three of her books. Keep meaning to read more, especially want to read ‘Ladder of Years.’ Another great selection. Persephone Books are awesome! I love hearing that people are reading Whipple and others because of their important work. Wow, that’s a long bookshelf! I am starting on a blog “for lazy readers” and I’m searching for some short, easy-to-read books for reviews. Which books would you recommend? What a great blog idea. Maybe The House on Mango Street by Sandra Cisneros or The Pearl by John Steinbeck? I’ve read Summer, Ethan Frome and Breathing Lessons. Summer was the very first book of Wharton’s that I read. I read one her short stories in a college English class and was immediately drawn to her writing. Wharton’s short stories are just as good as her novels. Happy to hear that you discovered Summer right off the bat! I’ve been meaning to read The Divine Secrets of the Ya-Ya Sisterhood for ages because I really enjoyed another of Rebecca Well’s books: Little Alters Everywhere.I’m fairly sure both books involve the same characters. If you enjoyed the Divine Secrets, you should definitely read Little Alters Everywhere. I’ll have to look into that one. Thanks for the recommendation!